The next £eith decides decision-making event is on 7 February 2015 at Leith Community Education Centre. The Leith Neighbourhood Partnership have handed over the decision-making on the allocation £22,092, in grants of up to £1,000, to the people of Leith. 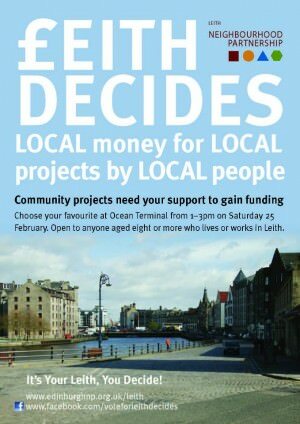 Leith Decides has been a long running and successful example from Scotland of residents deciding on small grants to develop community based initiatives. Applications are now invited to be submitted by 31 October 2014. Contact loraine.duckworth@edinburgh.gov.uk if you have any questions.